Several weeks ago I spoke to my colleague Gwyneira Clark about the lack of progress with finding funding for a permanent memorial for the 125th years since the Llanerch disaster. We agreed that something had to be done so we came up with an idea of a memorial service to bring the community together and launch a memorial fund. 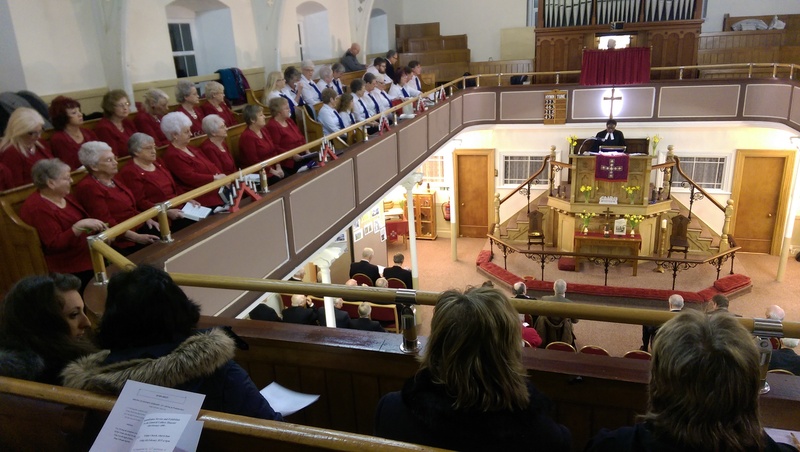 Straight away we got in touch with the minister of Trinity to book the chapel and then with the church committee we called a meeting at my house to discuss an order of service and hymns, we also decided to invite the three choirs from the area to take part in the event. After much thought we came up with the readings and decided to ask a few residents to read their poems at the service. As the event drew near, we were unsure of how many people would support the event and went about publicising it, we were amazed at how much interest was being whipped up and received various phone calls from radio stations and local press who were keen to get involved. We as Councillors decided to take a back seat with interviews and just keep publicising the event, In the mean time we asked various people to speak on the radio instead. The Free Press contacted us and asked if they could help and asked if we would go to the Llanerch site for a photo to add to the article, so we invited Mr Alan Betty a long standing campaigner to come with us. When I got home, feeling moved by being at the site of the explosion, I decided to post on twitter that I was going to walk to the site on the day of the explosion and taking the route families did as they went to the pit 125 years ago at the same time to look for loved ones and lay flowers. Within minutes of posting I had several requests from people wanting to come with me, I rang my colleagues and asked what they thought about making it official and inviting the two ministers along, one from Noddfa and the other from Trinity, as it would add more to the day to remember those killed. Then it snowballed and last minute we decided to invite school children along around the same age as the ones who died in the disaster, to lay flowers instead of us. This was planned within hours of the event and turned out to be a very moving start to the day. We then spent the rest of the morning and early evening setting up the chapel. At the Service were Paul Murphy MP, Lynne Neagle AM, Ken Clark from the local history Society, and the Scripture reading by the Rev Bev Morgan from Merchant’s Hill Baptist Church, Peter Walker from the Big Pit Mining Museum gave an address, followed by a reading – Pit Disaster by Joan Targett. A Miner’s Lamp penned and read by David Davies, put a lump in many a throat and was very moving, the choirs, the Apollo Singers, the Spirit Choir and the Garndiffaith Gleemen added to the evening. The event was very successful and the fund was launched, raising over £500 on the night. The following pictures from February 6th 2015 document the community remembering the disaster at the colliery that killed 176 men and boys and later at the church service.